Well I am now relaxing with friends in Delhi after 10 days skiing in Gulmarg, Kashmir. I had hoped to post updates on the shoot while I was there, but unfortunately my assumption of a fast and seamless internet connection was proven to be rather optimistic! 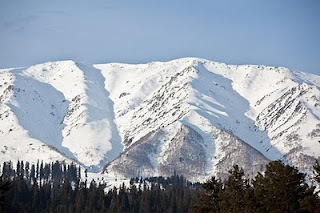 So what's so special about Gulmarg? Gulmarg is a small village in Kashmir, about 2 hours drive from Srinagar, which sits at the bottom of an enourmous mountain, Affawat. Gulmarg has begun to appear on the radar of Western skiers over the last 5 years or so after installation of a second hand gondola from a French ski resort. Reported to be the highest ski lift in the world, the gondola will slowly transport you up to 4000m, from where it is possible to ski back down. And the beauty of it is there are no pistes. Just you, and the mountain. But more than that, at 4200m high, Affawat is a serious undertaking for any skier, but to compare it to a single alpine peak would be misleading. It is in fact an enormous ridge, and once you have skinned up the final 200m from the gondola station to the summit, is is possible to traverse across and drop in to any off the numerous bowls along the front or clime up the mighty Shark Fin ridge at the back. The backcountry skiing opportunities are almost unlimited. Despite it's reputation for bottomless powder, this year Gulmarg has had limited snowfall. For my first few days we were able to access untracked conditions by skinning across the summit ridge and dropping into some of the more remote bowls. But when the first snow for a month eventually came half way through our trip, the base layer was so weak that the avalanche risk went through the roof. While this limited us to the lower slopes, we had great fun skinning up and skiing back down through the trees on nearby Monkey Hill and down to the shrine at Babarishi. When we did eventually head back up the mountain, our guide had a lucky escape after being swept 300m by an avalanche down a 40 degree couloir. Amazingly his head was sticking out of the snow when we found him, and he was uninjured. But it was a timely reminder of the dangers of back country skiing. We were shooting both stills and video on this trip, and while it will be a few weeks before we have edited the video, I'll be able to share some stills on the website shortly. 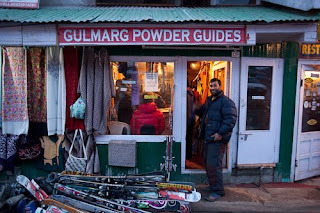 In the meantime, for anyone planing there own trip to Gulmarg, here are a few useful links. I am the author of GULMARG '09/10. Sam Lozier of Famous Internet Skiers is the contributor to the Boston Globe website. Oops - sorry for the mistake. Have updated the post.